Dressing up for Halloween doesn't mean that you have to wear a costume. 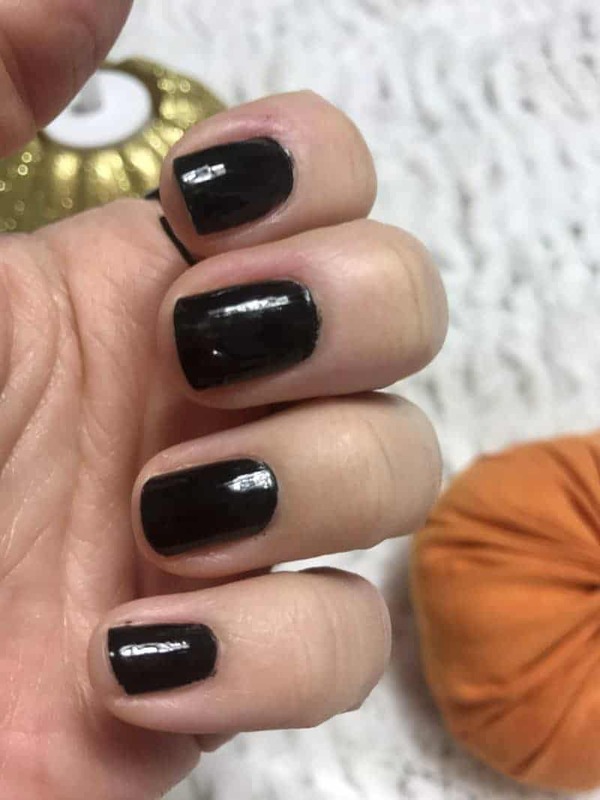 Get a fun Halloween look without wearing a costume with these easy tips. As we get older, many of us stop wearing Halloween costumes. I think that the last time I wore an actual Halloween costume was over 5 years ago, and even then it was only because I was attending a Halloween party. When we are children we dress up in Halloween costumes each year to go trick-or-treating. But typically by the end of high school, we stop going trick-or-treating. When trick-or-treating stops, dressing up often stops as well, with the exception of being invited to a Halloween party. But it doesn't have to be that way! Adults can still have fun rockin' a Halloween look, no costume necessary. With the right makeup, clothing, and hair products getting a Halloween look is easy. You can rock your Halloween look to work, while taking your kids trick-or-treating, or while answering the door for trick-or-treaters. I am sure the children – and your co-workers – will get a kick out of it! That is why I decided that this year I wanted to celebrate Halloween with a fun Halloween look. And I am glad that I did because I had a lot of fun creating my Halloween look! Read on for my tips with you on getting a fun Halloween look, sans the costume. Black and Orange are the quintessential colors of Halloween. So, if you are going for a Halloween look be sure to wear these colors on the big day. You can wear each color on its own, or combine the two. I paired an orange tank top with a black hooded sweatshirt for an easy Halloween wardrobe made of items I had right in my closet. An alternative to wearing black and orange is wearing a Halloween T-shirt. You can find t-shirts with pumpkins, haunted houses, and fun Halloween sayings. Halloween is the perfect day to try something fun and different with your hair. For my Halloween look I went for wild little pig tail knots and twistys / faux dreadlocks on either side of my face. I knew I needed a super strong hair gel to pull of this look, so I picked up a tube of Got2b® Glued Styling Spiking Hair Gel from Walmart. For hair with attitude, I look for Got2b®. Got2b® makes a wide range of unisex hair styling products. 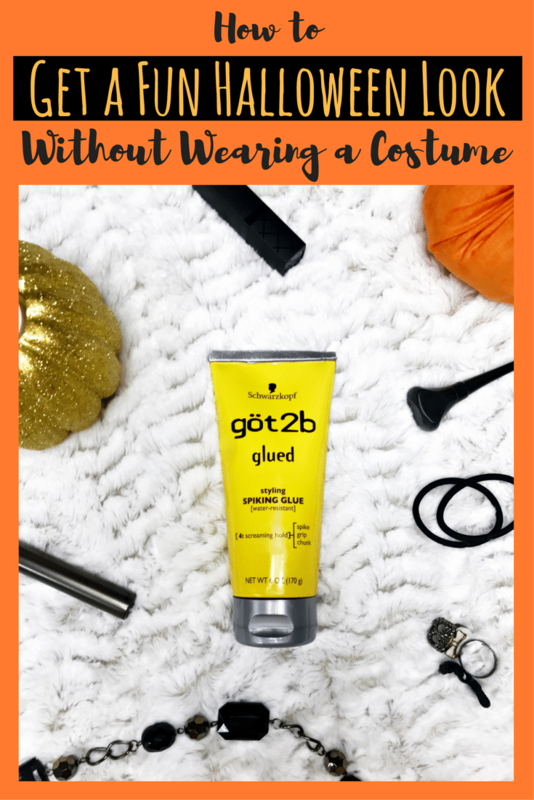 Whether I am looking for a silky and shiny straight ‘do or hold and texture like I am for this Halloween look, I know Got2b® has just the product. Got2b® gets that you've got2b you. 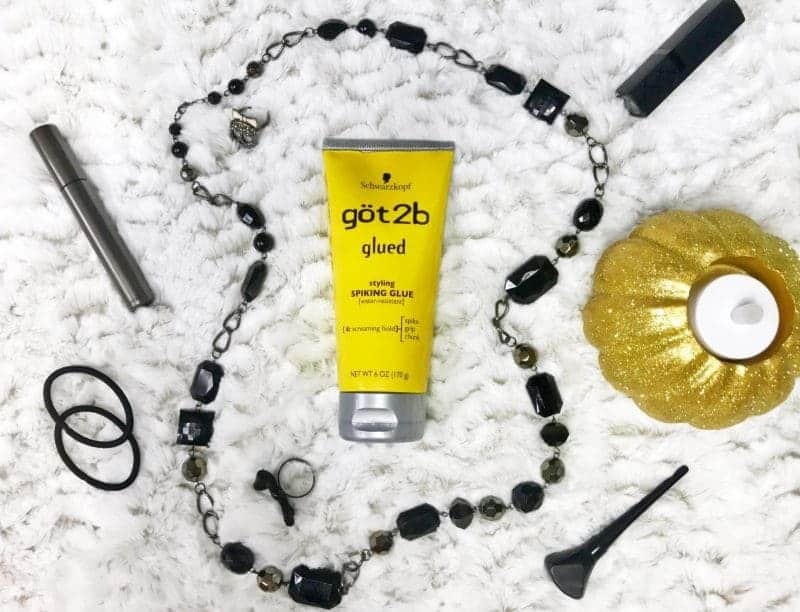 Got2b® Glued Styling Spiking Hair Gel is no joke – it locks hair in place with it's strong hold and keeps it in place all day long. It is water resistant and even holds up well in humidity or a bit of rain. 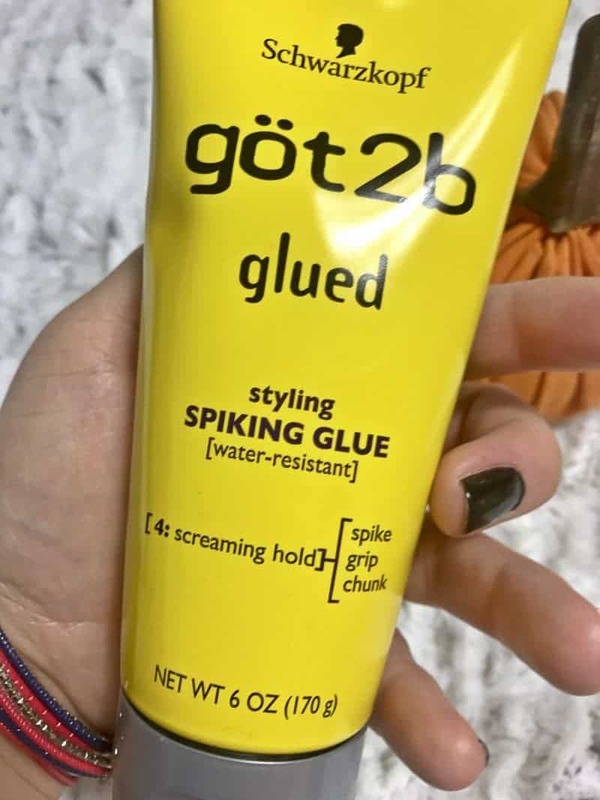 While Got2b® Glued Styling Spiking Hair Gel is perfect for spiking hair, it is also great for making twistys. To get this look I separated a section of hair on either side of my head, and massaged a dab of Got2b® Glued Styling Spiking Hair Gel through it. 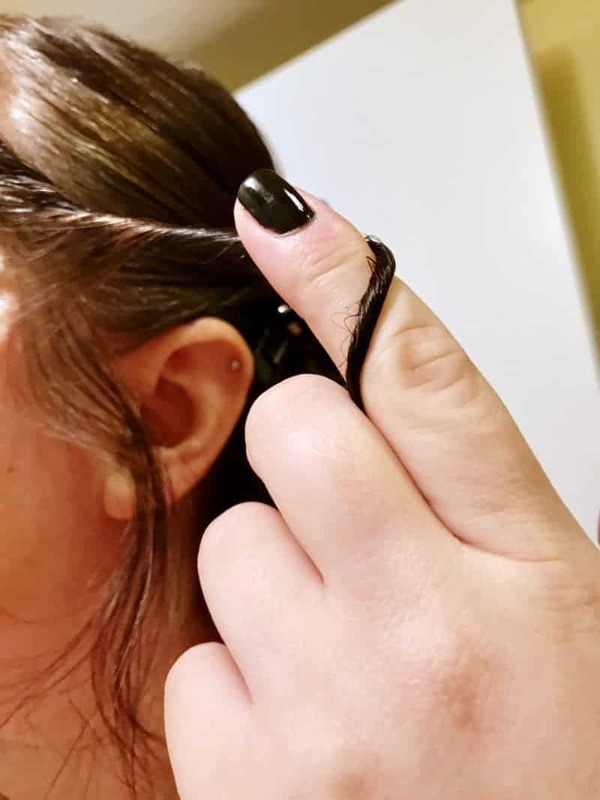 Then, I twisted the hair around my finger to give it that messy twisty look. Next, I pulled the rest of my hair into pigtail knots, high on top of my head. And finally, I added a bit of Got2b® Glued Styling Spiking Hair Gel to each to give them a messy look. 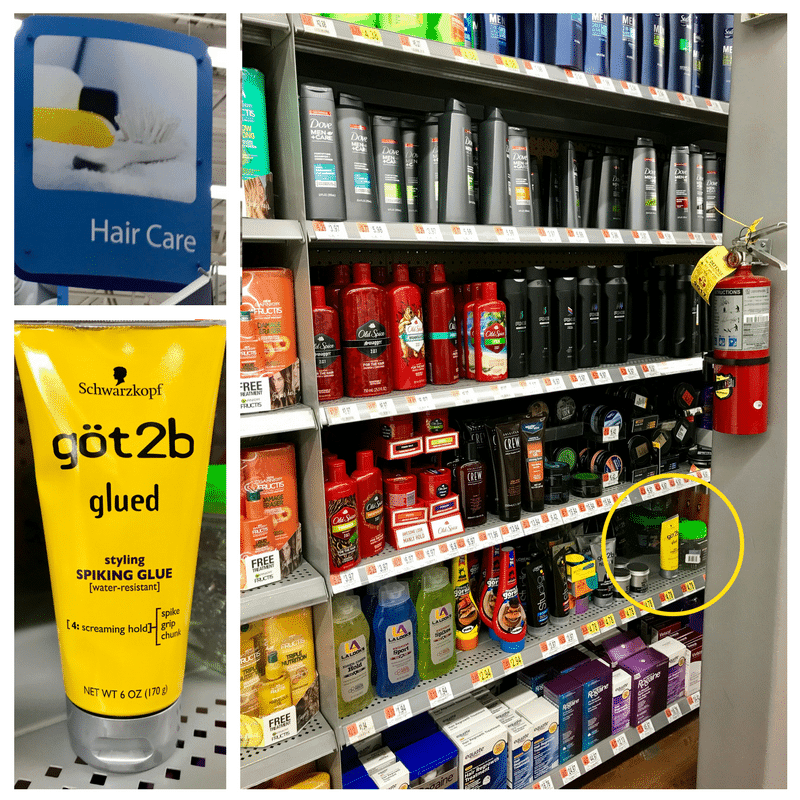 Got2b® products are available at Walmart. Find them online or in-store in the Hair Care section. Plus, for a limited time you can earn $1 with ibotta on all your favorite got2b items! Are you on Instagram? You can follow Got2b® on Instagram here. Halloween is the perfect time to have fun with your make-up. So break out that eyeliner and black eyeshadow and go to town! 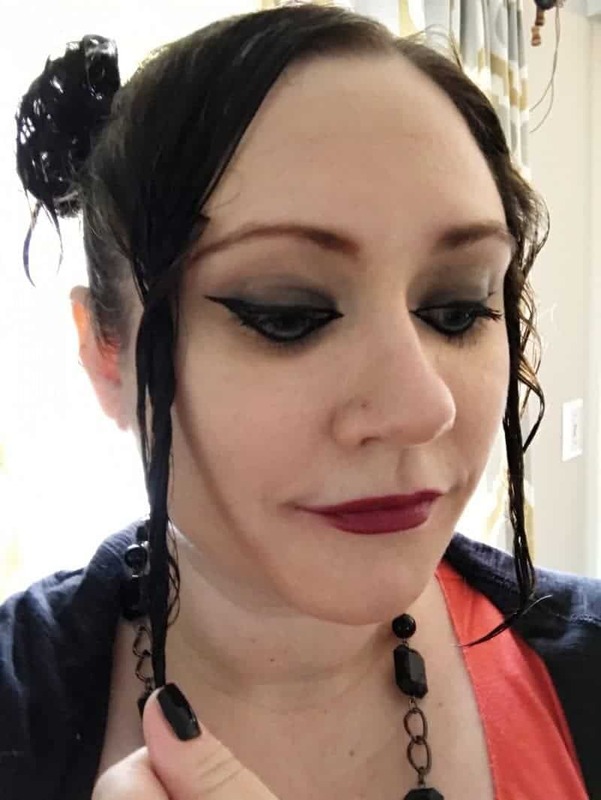 I went for a very dramatic cat eye look, using liquid black eyeliner, black eyeshadow, a bit of white eyeshadow to highlight and a LOT of black mascara. To complete your Halloween look choose a bold color of lipstick. Think bright red, orange, or black. Don't forget your nails! Paint them with a black polish or even use black and orange polishes and alternate colors on each nail. 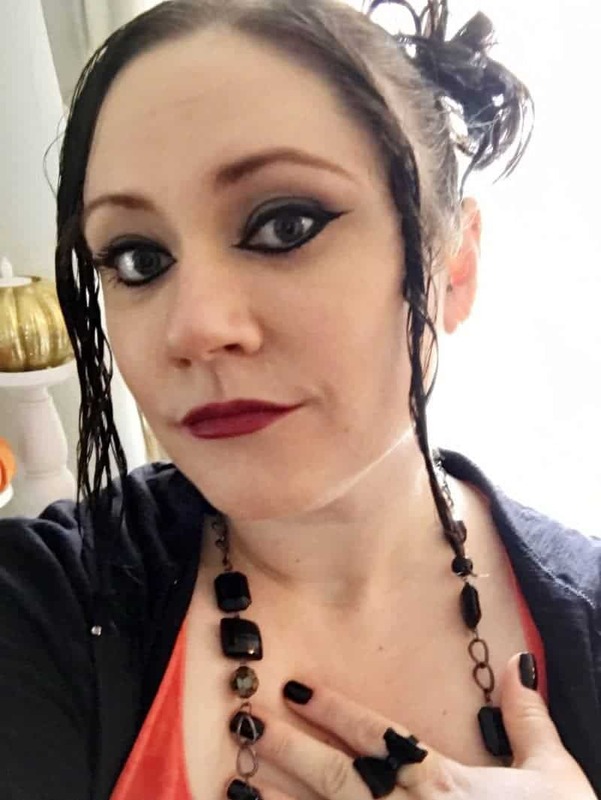 I wore a long black beaded necklace, a black bow ring, and a skull ring for my Halloween look. 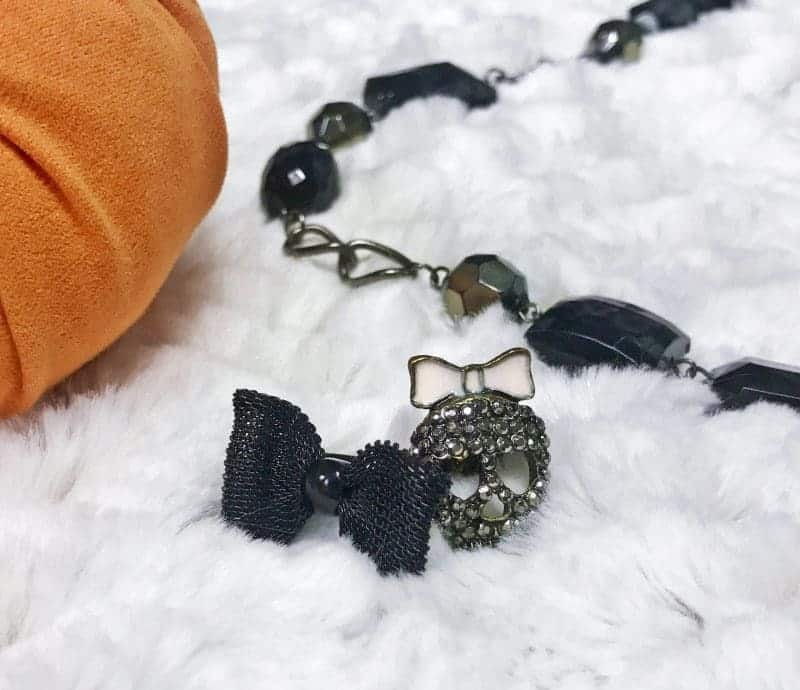 But, the options are endless with fun pieces that can add to your halloween look and really make a statement. I hope that you enjoyed these tips on getting a fun Halloween look without wearing a costume. Will you be dressing up to celebrate Halloween this year? What will you be wearing? I would love to hear from you in the comments section below! Love your eye make up and the hair tips are awesome! I am stuck in the shoulder length hair routine, thanks to your tips I’ll try something new! We used that stuff last year when Madison dressed up as Junkrat! I think we went through a whole tube! I am not much of a costume person, but love the idea of rocking bold makeup and a fun hairstyle for Halloween! An all black outfit with plenty of lace and fishnet tights would make an awesome touch too. Love the thrifty ideas, I could even do these… I hate all those hot stuffy costumes but hair, some nail polish, a bit of jewelry are all things I can do. Love it! I love your eyeliner! Since having kids I never have time to dress up for Halloween. I’m always too busy getting 5 kids ready to go! I like to wear Halloween colors though and wear a kitty cat ear headband for fun. What a great look for Halloween! I love how your hair turned out, I know my girls are itching to do their hair and make up for their costumes. We have that glue for hair, totally the same one! 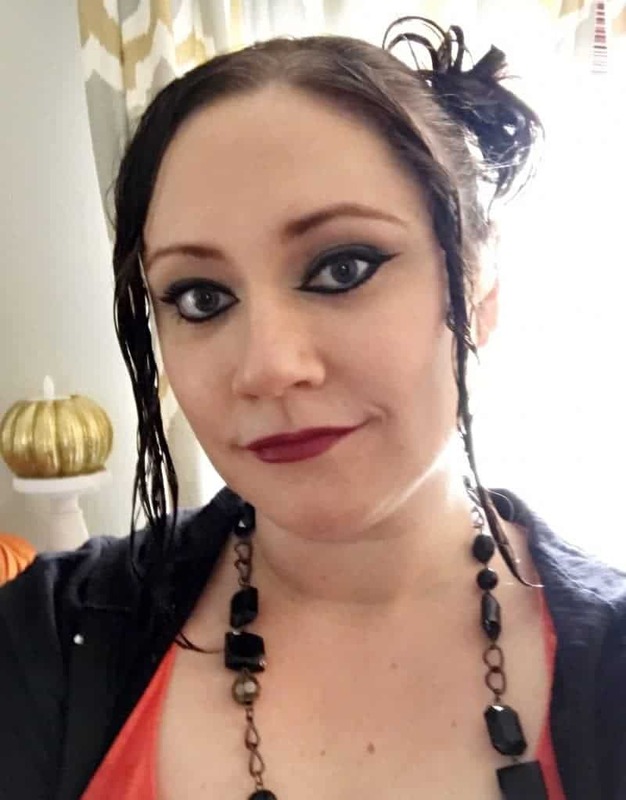 I will have to use your tips here, because I don’t generally dress up in a costume but want to look somewhat Halloween ready when I take the kiddos out trick or treating!